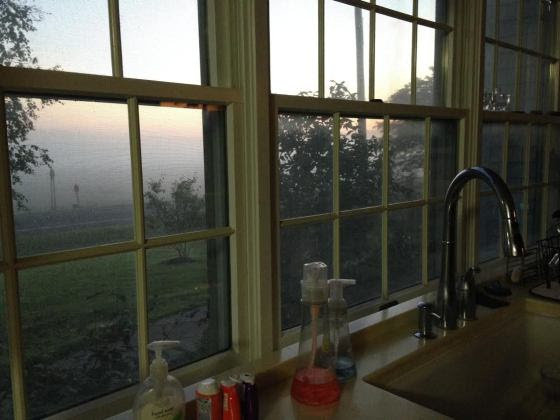 Millie stood at the window and stared into the early morning mist. This was her favorite time of the day when the quiet awakening of the world enveloped her like a soft blanket of hope. She smiled as the sun began its rise over the distant hills. As if from the hand of God, prism like tentacles of light stretched through her window and brushed her cheek. Renewed in spirit and strength, she ran a hand over her bald head, felt the first hint of new growth, and said a prayer of thanks for another day. ← You Asked: Can You Explain Backstory? Brilliant. the New dawning day full of hope was well described, setting us up for the reason the person is noticing it – clearly a cancer survivor. Very neatly done with some impressive imagery. Excellence in 100 words. Thanks so much for your kind critique. Glad you liked it. I so appreciate you taking the time to stop by and read. Hope you have s Merry Christmas and Happy New Year. Beautiful brave thankfulness. It’s one of life’s greatest displays of beauty. What a lovely comment. Thank you Joseph for stopping by the Cow Pasture and taking the time to read and comment. May you and yours have a Merry Christmas and Happy New Year. Finding strength in the little things is so important when going through that stuff. Yes, it is. I have two family members who has been traveling this road. One is in remission, the other going on six years of daily chemotherapy. Her goal is to live to see her oldest child graduate from high school. She is one of the bravest persons I know. Thank you for taking the time to read and comment. I hope you and your family have a very Merry Christmas and Happy New Year! I enjoyed your description of the day and was reminded how much I too enjoy the early morning. And then your last paragraph hit me. I like the way you subtlety tell us of her illness. Thank you. In also an early morning gal. I’m glad you enjoyed the story. Thanks for stopping by the Cow Pasture, reading and commenting. The first paragraph set the rest of the piece up quite nicely (enveloped in a soft blanket of hope). We do need to remember that everyday is a gift. After all, that’s why they call it the Present. Thank you so much for your kind comments. I’m glad you liked the story and you’re so right- everyday we get to see the sun rise is a gift from God. Thanks for stopping by and taking the time to comment. Thank you. So glad you liked it and thanks for stopping by. Thank you so much stopping by the Cow Pasture. I’m glad you liked the story and thanks for your kind comments. Nicely done, with a note of hopefulness. Thank you Sandra. Glad you liked it. Happy you dropped by the Cow Pasture. “As if from the hand of God, prism like tentacles of light stretched through her window…” I loved the picture you painted with this sentence. Beautiful, poignant and thought provoking. Great job. I really like how to understand the story behind in the last part with the growth of hair returning… great writing. Thanks Bjorn for your kind comments. Glad you liked the story and thanks for stopping by the Cow Pasture. A great depiction of a moment in the life of someone coping with cancer. Thanks Patrick for your comments. Glad you liked it. Glad you stopped by the Cow Pasture. This puts me in mind of a dear friend who is a cancer survivor. Nicely done. It was in fact early morning when I snapped this one. So sorry to hear of your friend. I hope her health continues to improve. Thanks for such a beautiful picture and thanks for stopping by to comment.